Quite often I'm researching a particular topic when a thread starts on a forum or social media. 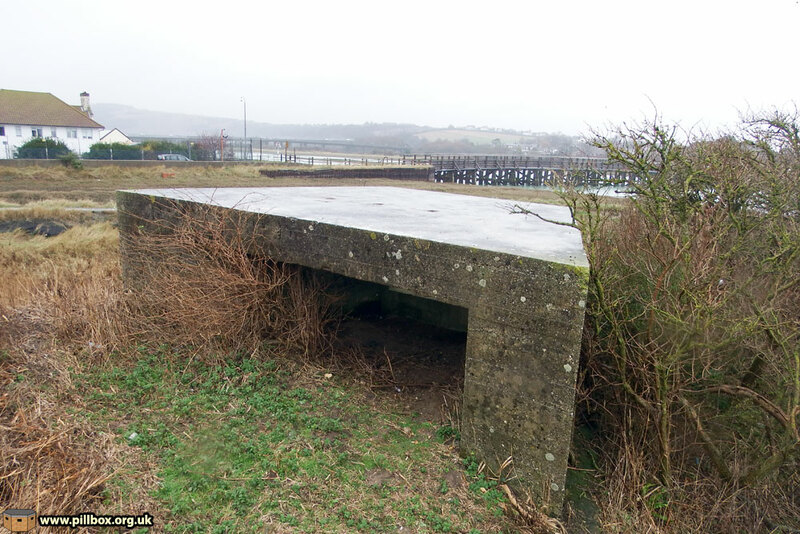 The subject of hardened gun emplacements for field artillery recently cropped up just as I was researching gun garages at Newhaven and Shoreham. The term "gun garage" is used here as a semi-official alternative to "gun emplacement." I say semi-official as the term is regularly used in Royal Engineers files for the infantry division in this area in 1941 and appears to be local nomenclature. Inside the garage showing the bridge over the River Adur; note the three vents in the roof. These are lengths of drainpipe. Were they were built to house the 25-pounder field gun? Was the field of fire restricted to just cover the bridges they overlooked? Was the open rear sandbagged for protection once the gun was inside? I took an interest in these garages even though they are in West Sussex as I was researching a broadly similar structure at Newhaven and the example at Shoreham would provide a useful comparison. My first port of call (as usual) was the documents. Although West Sussex is outside my area of expertise there is a grey area created by the various divisional boundaries changing in 1940-41 that means that I have seen some files of units in this area. The first issue to deal with is weaponry. The West Sussex Historic Environment Record (HER) entry and the Defence of Britain Project record that informed it both mention the emplacement as being for a 25-pounder gun. It appears that this is ultimately based on published secondary sources, but it is common to simply assume that as the standard British field gun by the end of WW2 was the 25-pounder the structure must have been designed for it. There are two problems with this; firstly, there were two guns laying claim to the title of '25-pounder' but they were few and far between in the UK in 1940 and secondly, there were several field artillery pieces on issue at that time of crisis. A quick explanation of terminology within the 'field artillery' category may be useful here. Broadly speaking, a gun is a light piece; it usually has a long barrel and fires comparatively small shells along a flat trajectory at high velocity using large propellant charges. A howitzer on the other hand, is typically a short-barrelled weapon that fires larger shells along a high trajectory (up to 45 degrees with the howitzers we're looking at) with smaller charges at lower velocity. The high angle allows the shell to plunge down onto the target, meaning that a howitzer can lob shells over features such as hills, woods and towns. The British Army had fielded the 4.5-inch howitzer and 18-pounder gun throughout the Great War, but by the mid-1930's was trying to combine the key advantages of both into a single weapon, or a gun-howitzer. The result was the 18/25-pounder (a.k.a. 25-pounder Mk.I) which was an 18-pounder modified to fire the heavier 25-pounder round. 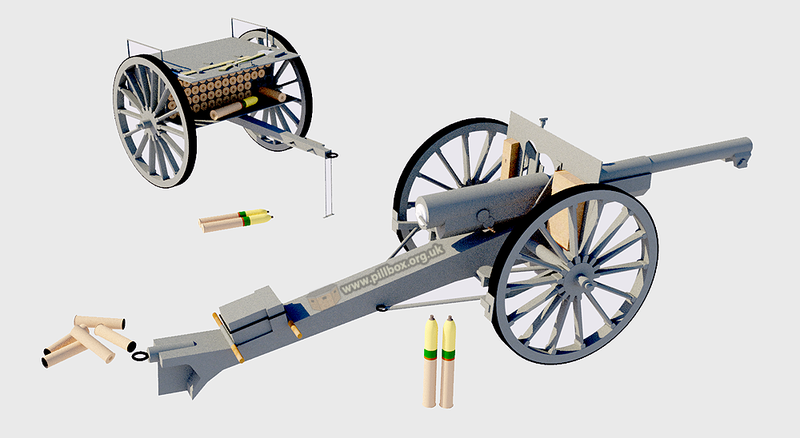 This weapon evolved into the Mk.II, which is the gun commonly known as the "25-pounder." At 87.6mm, the 25-pounder's calibre was a compromise between the 84mm 18-pounder and the 114.3mm 4.5-inch rounds. The 25-pounder had an elevation range of -5 to 45 degrees. Whereas the 18-pounder used single-piece ammunition (i.e., the shell was supplied inserted into top of the case) the cartridge case and shell for the 4.5-inch howitzer and 25-pounder were loaded separately. This allowed the case to be filled with the requisite number of bags of propellant in the field to vary the charge. As the 25-pounder case was longer than that of the 4.5-inch, presumably greater charges could be employed to fire low- or high-velocity rounds as the situation and gun elevation demanded. The 18-pounder (photo at right) was still on issue to Territorial regiments in 1940. It had been modernised during the 1930's to have pneumatic tyres and a firing platform that was slung underneath the carriage. Once the gun had been run onto the platform, it could rotate 360 degrees around it on its wheels without the need to heavily manhandle the gun to and fro. The platform was also used for the 25-pounder models. 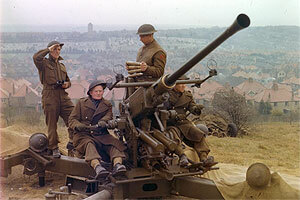 We can see that in East Sussex in 1940, there were only twelve 18/25-pounders and that the 75mm guns were the backbone of the field regiments. Note the shortfalls; a field regiment was supposed to have 24 guns, giving the infantry division with three field regiments a total of 72. 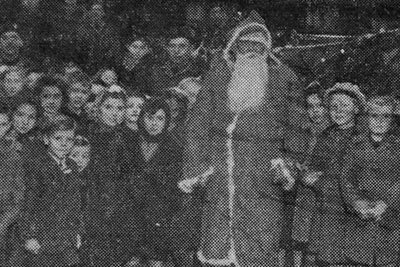 It is not until mid-1941 that Mk.IIs appear in East Sussex and late that year that a full complement is recorded. The only comprehensive divisional West Sussex data I have is March 1941, but it can be seen that this data fits nicely into the pattern in that 75mm is the most common, followed by 4.5-inch then 18/25-pounder. I can't honestly see that the missing data for West Sussex (missing only because I haven't specifically researched in as much detail as I have for East Sussex) would buck the trend shown above. The September 1940 data is from a single field regiment based in Shoreham August - October 1940. They arrived with sixteen 75mm guns, receiving two 4.5-inch howitzers two days later. Another pair of both types by 20 August and a further two 4.5-inch howitzers brought the gun strength up to 24 on 10 September. The data for seven points in time covers six Anglo-Canadian divisions; only the June and November 1941 data are from the same division. This indicates that the balance of guns is broadly similar across multiple regiments and divisions. 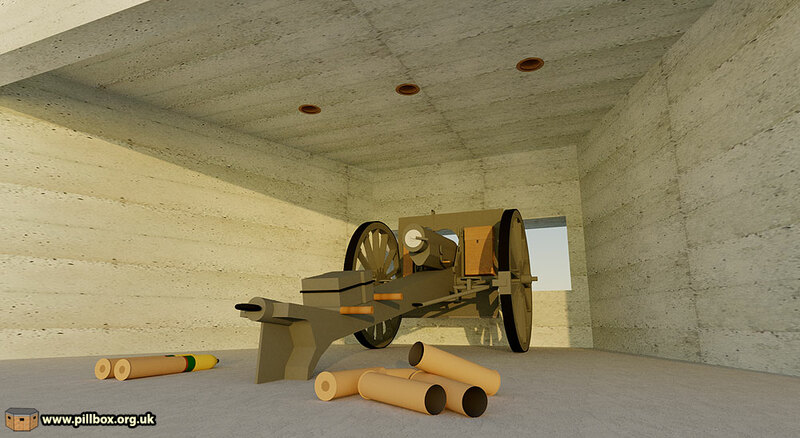 Therefore, we can safely say that the gun garages were NOT built purely for the 25-pounder gun (either variant) as there were precious few of them around at the time of construction. This is not to say at this stage that a 25-pounder would not be compatible with the emplacement though; we'll return to this idea later. While we're looking at the documentary evidence, we can examine the camouflage aspect. The forum discussion speculated about earth banks against the flank walls (for additional protection), camouflage nets and turf growing on the roof. 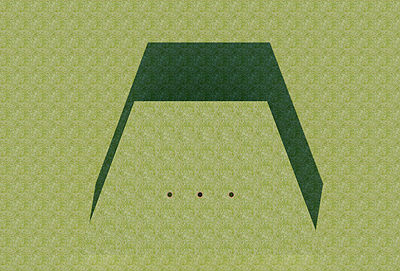 While some of these extant structures do have grass seeded on the roof and this technique can help the shape and shine issue, it still leaves the shadow problem as illustrated in the graphic at right. 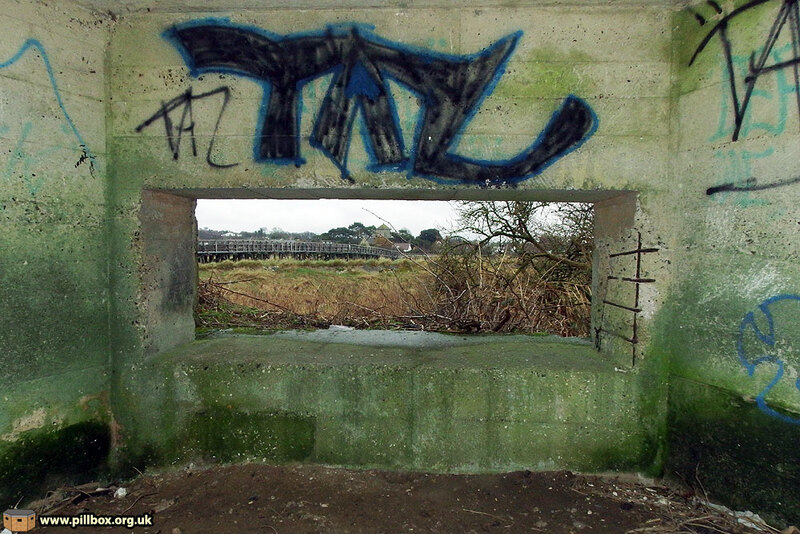 Gun garages have been built in the past at all crossings of the River Adur and Arun. In most cases these have been camouflaged...usually by building kiosks, huts etc around them. Most are completed and remainder are dealt with as and when RE personnel are available. A certain amount of maintenance is necessary. The CRE also mentions that there are two files (nos. 21 and 166) maintained on the subject of gun garages. Sadly, these will have not survived, but it perhaps helps destroy the myth that the army did not keep records of defence works. The war diary of a Royal Engineers field company also tells us that at least 29 man-days (for example, almost the equivalent of ten men working for three days), were spent in camouflaging the Shoreham gun garage. This perhaps confirms a considerable wooden structure built over the top to confuse the Germans. As stated above, the garages were built "in the past" ie, before March 1941 and the camouflage is only at this time being applied. 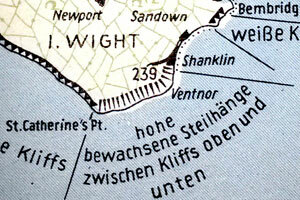 A quick look at the German Befestigungskarten ('Fortification maps') for 1 September 1940 shows that the Luftwaffe had not noticed any activity at the site of the Shoreham emplacement. As the camouflage is not in situ until 1941, the emplacement would have been clearly visible, meaning its construction probably commenced sometime after 1 September 1940. The best way to resolve some of the issues is to reconstruct the emplacement and see what we can glean from it. I went to see the structure at Shoreham and did a very basic survey of it in order to produce a 3D model (graphic below); the dimensions and shape of the foundation are speculative as only a small portion of it was visible. I had already built a model of a French 75mm gun for the Newhaven gun emplacement I'll be comparing this type with in a future blog post and, as the 75mm is the most numerous field gun in Sussex in 1940 it makes sense to see what happens when we place it in the garage. 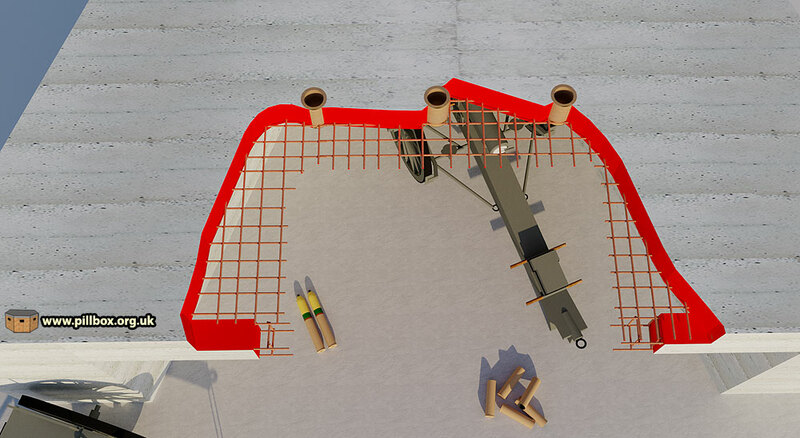 The model (graphic below), is not super-detailed as it only needs to be to scale and recognisable as a 75mm gun to the layman. I also drew an ammunition caisson. 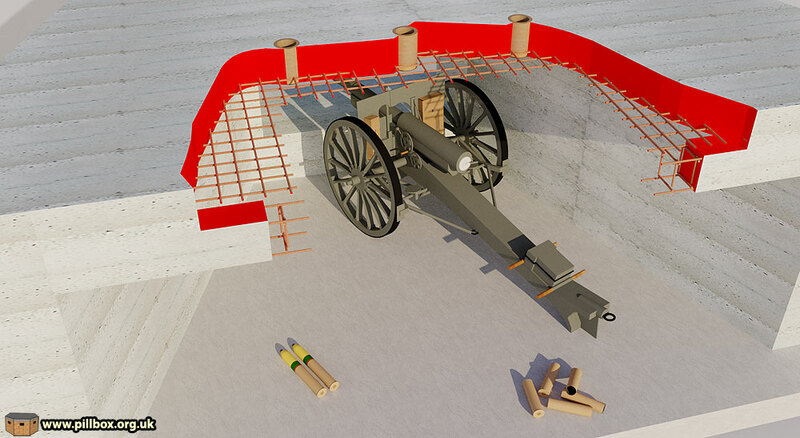 The graphic below shows the 75mm gun in position; the roof has been cut away to illustrate this. The three pipes used as vents are evident. The ammunition caisson is outside the emplacement; although there is technically room for it inside, I feel that this would have impeded the gun's operation. Note the beam at the rear that supports the roof; this gives the impression from the outside that the roof is twice as thick than it actually is. Graphic below: frontal elevation with 2m range poles for scale. Graphic below: cutaway elevation; while the flanking walls are 1.15m thick with a frontal wall of 1.06m, the roof is only 30cm thick. Note how the gun fits nicely without the muzzle protruding beyond the outer wall. The floor of the Shoreham gun garage was mostly covered in a few inches of mud, but I'm told that the floors in other examples bear no evidence of features such as pits to accommodate the gun trail to alleviate the effect of recoil. The graphics below place four key weapons in the emplacement. 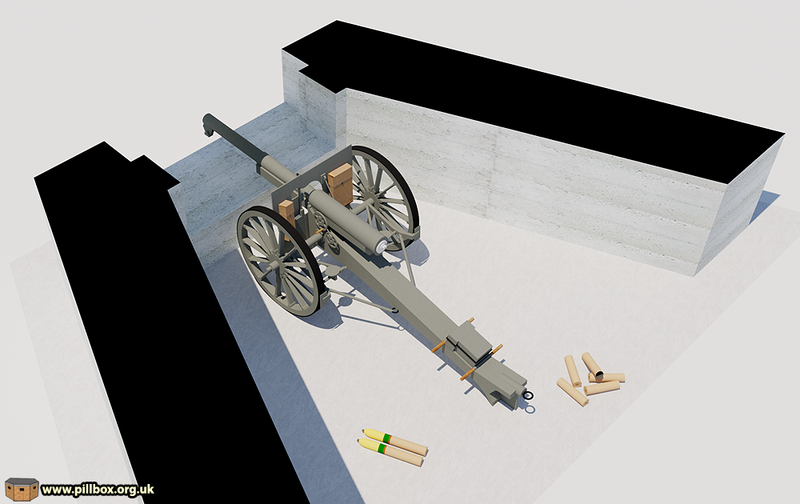 Three are elevation drawings that I've hopefully scaled correctly to keep the guns in proportion to the structure. 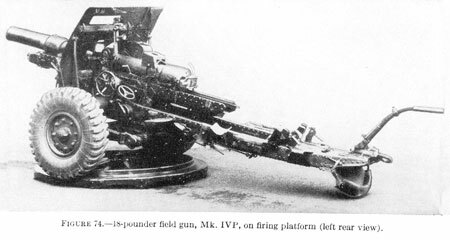 The 18-pounder gun drawing is of an early type (Mk.I or Mk.II) with the recoil buffer above the barrel; some war diaries mention a small number of the Mk.II on issue in 1940. The US 75mm is pretty much the same weapon, although none of the units in East Sussex explicitly list this type as being on their strength. I couldn't source a scaled elevation of the later Mk.IV 18-pounder, but I suspect they were a similar size. The barrel is mid-height in the embrasure and so it would appear to be a suitable weapon. The folded handspike (the handle at the rear used to turn the gun - see the 4.5-inch howitzer below to see it in the extended position) may project beyond the structure when in use, but otherwise the gun fits. Like the 18-pounder, the French 75mm also fits the bill perfectly; the barrel is the centre of the embrasure and the gun length is wholly inside the emplacement. As there appears to have been few 18-pounders in circulation (just 6 in East Sussex in 1940) and given that the 75mm was the most numerous gun, it is the most likely to have been destined for these emplacements. Although the 4.5-inch howitzer does fit in the emplacement, we can immediately eliminate it as a likely occupant because it's a howitzer designed to fire at low-velocity on a high trajectory. I would imagine that it would have lesser effect firing horizontally in an anti-tank role. The fact that the gun muzzle barely protrudes beyond the lip of the embrasure probably has negative outcomes in terms of muzzle flash, blast, acoustics and build-up of carbon monoxide in the emplacement. Now we have the 25-pounders; the Mk.II is shown here. Again, it physically fits in the garage, but we can see that it is too large to operate efficiently. A trunnion height of 1.15m raises the barrel towards the top of the embrasure. But why put a howitzer in a static emplacement when you can dig it in out of sight on the other side of a hill and shell the bridge with indirect fire? The same point effectively rules out the 18/25-pounder too. We have established that the gun garage was not designed for one individual gun, but was more about a class of weapon. The situation of these emplacements is that for which the 18-pounder and 75mm guns were designed; high-velocity, low trajectory shooting. No artillery commander would waste the high-angle capability of a howitzer by putting it in a concrete box. By the time the 25-pounder (either type) was available in any quantity, the notion of static gun emplacements for field artillery was all but redundant. Indeed, the artillery plan for West Sussex for March 1941 seemingly does not account for the gun garages. Only four of the 75mms are deployed singly and all of them are on the coast between Littlehampton and South Lancing covering the beaches. Only the gun at Littlehampton covering the mouth of the River Arun may be in a gun garage, given that they were only built along that river and the Adur. All the other field artillery is mostly deployed in troops of four where all guns can engage the enemy during the vital assault phase. Guns distributed in ones and twos up a river does not make sense, as only a small proportion of firepower is engaging the enemy at any one time. I have to explain about the division's six 25-pounders (Mk.I or II is not known); these were deployed in three pairs. Two of these groups are four miles from the coast while the other is six miles away - presumably close to the limit of their range. I think this proves that the value of the 25-pounders was such that understanding their nature and strengths determines their deployment. They certainly did not belong in a static emplacement right in the face of the enemy. Built for guns that didn't exist? Given the above, why were these emplacements ever built? 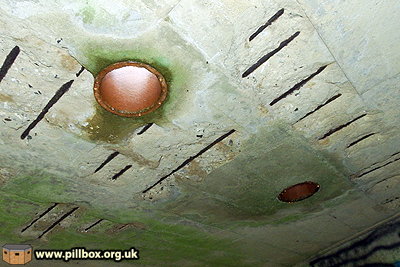 The only explanation that I can offer is that they were part of the pillbox hysteria of 1940-41. Pillboxes were often built to occupy the best fire positions and orders were issued to build, even if there were no troops available to actually man them. At this stage of the war, it was hoped that reserves would somehow be available to move in and occupy these extraneous positions in the event of invasion. As a result, a lot of structures were built that did not fit into any specific, detailed, military plan. Thus, in March 1941 we see the divisional engineers camouflaging the gun garages as fast as the divisional artillery is ignoring them. 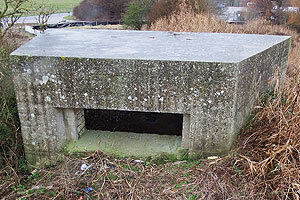 A good example of emplacements for non-existant guns is that of the Type 28 pillbox. (The graphic at right shows the Type 28A variant.) These structures were built in their hundreds on various stop lines and were specifically designed for either a 6-pounder Hotchkiss gun, or the 2-pounder anti-tank gun. (I've not included these guns in the list above for this reason.) The 2-pounder could be wheeled in and set up on its three-legged field mounting; the Hotchkiss Type 28 was permanently fixed by means of a holdfast with bolts to secure the gun in place. These emplacements were built on the promise that the guns to be mounted in them would eventually become available. In the case of the 6-pounder type, although some were armed, the supply of guns appears to have dried up prematurely, meaning that most never mounted a gun. 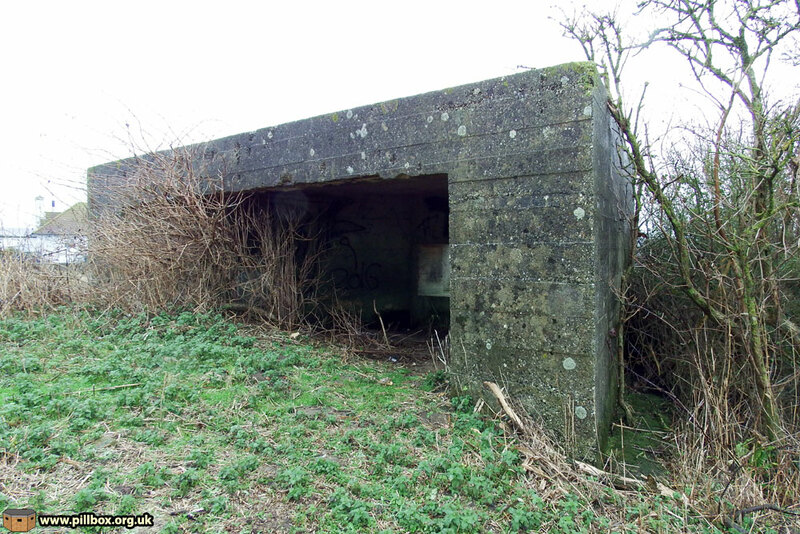 The Type 28A variant had an infantry compartment built on the side so that even if the gun never arrived, the pillbox was still militarily useful if only with small arms to defend it. 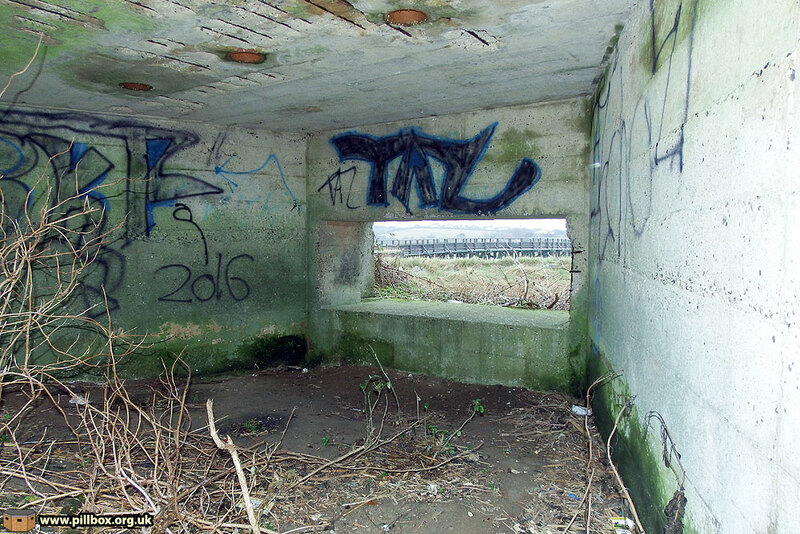 Despite this, construction of these pillboxes was reportedly halted. Something that always happens when I build a 3D model is that I begin to notice evidence that is not immediately apparent when you're standing in the real thing. 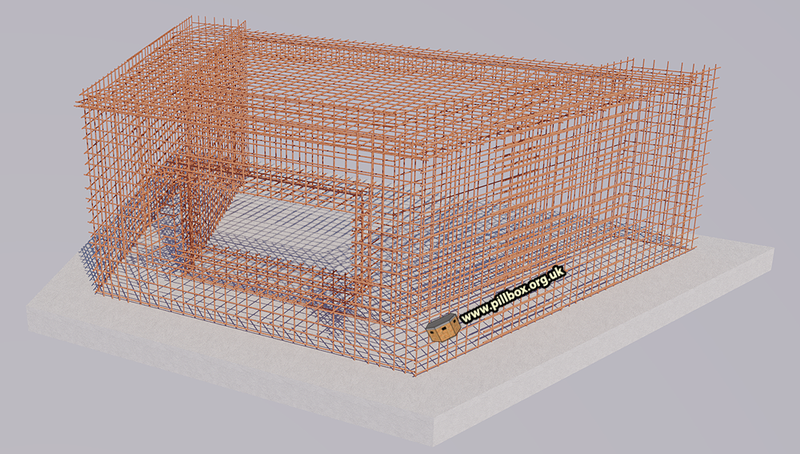 Reinforcing bars or rebar are used to strengthen the concrete; a mesh cage is built around which the concrete is poured. 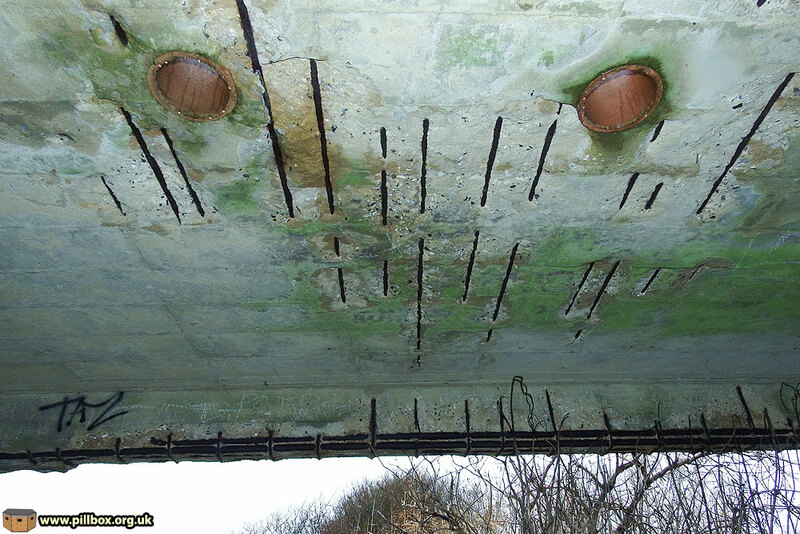 The photo at right shows the underside of the roof; water penetration (helped by the vent pipes) has caused the rebars to rust, expand and shatter the concrete. 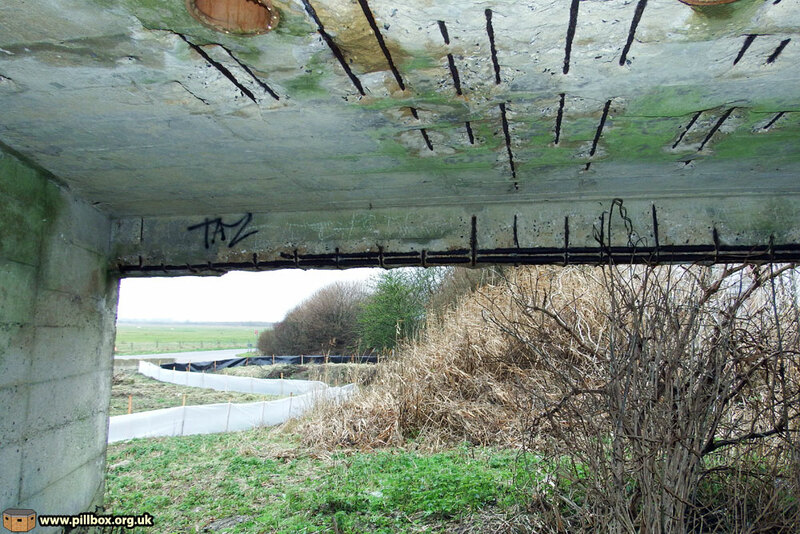 These structures were not intended to still be standing nearly 80 years after construction, so this degradation is only to be expected. The builders appear to have mostly used 15mm rebar at spacings varying from 12-16cm centres; this discrepancy in spacing seemingly indicates that they were not using spacers to regulate the distance between each bar and this was probably down to the urgency of the job. Using this data, I attempted to recreate the rebar structure as shown below. This reconstruction impresses upon one just how much material and effort went into building a single emplacement. Another point raised on the forum discussion was the supposition that the "25-pounder" in the emplacement had a restricted arc of fire as it was only firing on the bridge. The 3D model brought some interesting evidence to light regarding this. Firstly, nobody appears to have ever asked why the gun garage is the trapezium shape. Arc of fire is the reason; while moving the 75mm gun around in the model I decided to measure the angles of the flanking walls. 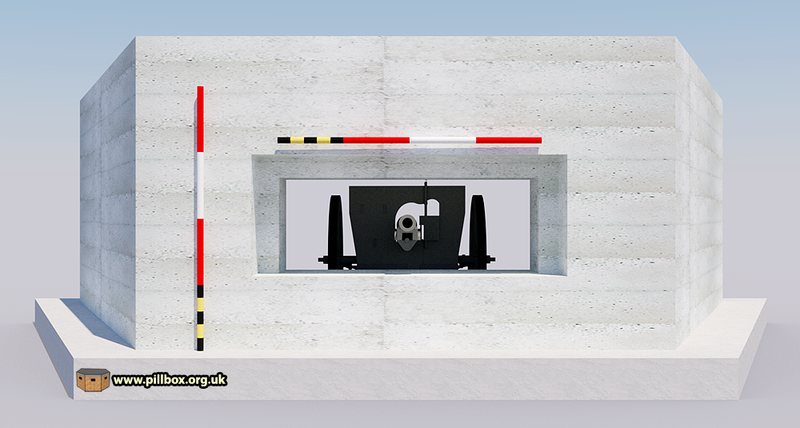 If you project the inner wall lines out through the embrasure until they cross, they describe an angle of 45 degrees. 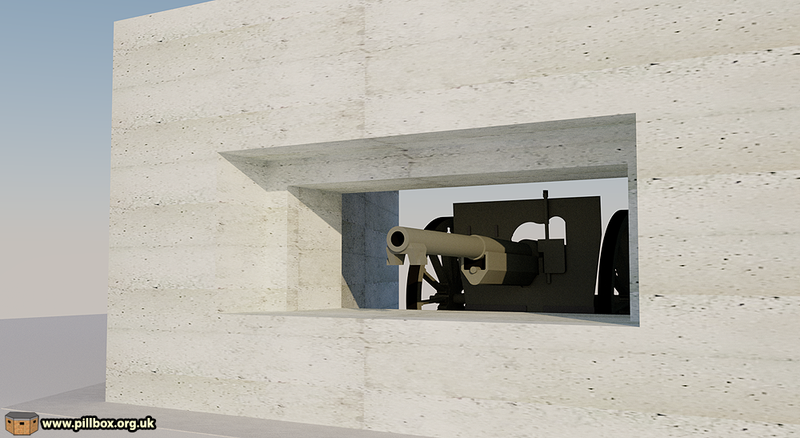 The angled walls actually allow the gun to be moved within the emplacement to cover the 45 degrees. The animation at right demonstrates how the gun covers the arc. Creating this animation then revealed another hidden secret of the gun garage. The red spots indicate the position of the pipe vents in the roof. It may just be coincidence, but the location of these vents appears to coincide with the breech of the gun in the extreme left, right and centre positions of the arc of fire. The vents are over the approximate location of the breech while the barrel is in the forward position, the reason for them being to reduce carbon monoxide build-up. This brings us round to another of the points raised on the forum; the question of whether the open rear of the garage would have been sandbagged for protection. My answer to this is - no - and there are several reasons for this. 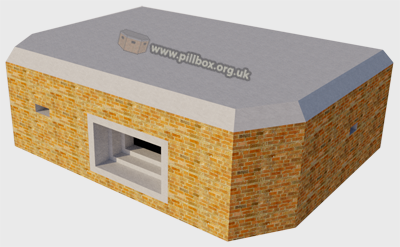 Firstly, ventilation would be dangerously restricted, allowing carbon monoxide to build up. Secondly, the gun would effectively be sealed inside the emplacement, preventing its withdrawal. Thirdly, the effort, time and materials required to adequately build a sandbag wall would be disproportionate to whatever might be achieved by doing so. Finally, the gun fits the emplacement for length perfectly; there is no room on the gun floor for sandbags to create a wall. 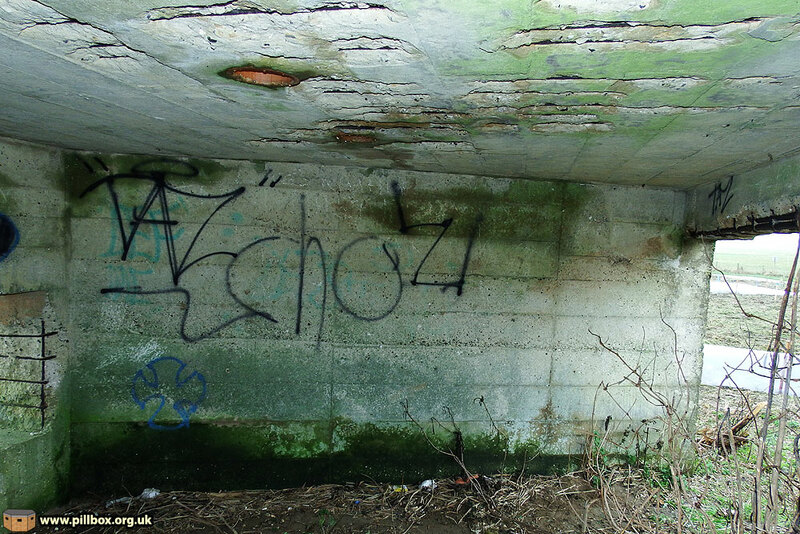 In a similar vein, people often declare that the embrasures of pillboxes and similar structures are too big. The open nature of the gun garage is to allow ventilation and accommodate perhaps two different types of guns with different dimensions. Although I mentioned my survey of the gun garage above, I've not yet put the structure into its landscape context. My first visit saw me undertake my basic survey, but a second excursion was required to confirm certain aspects of data and details in the landscape. It would be very remiss of me to view the Shoreham gun garage as an isolated structure; it formed part of a network of defence works and we need to examine the wider picture. The graphic below shows the 45 degree arc of fire projected into Google Earth. 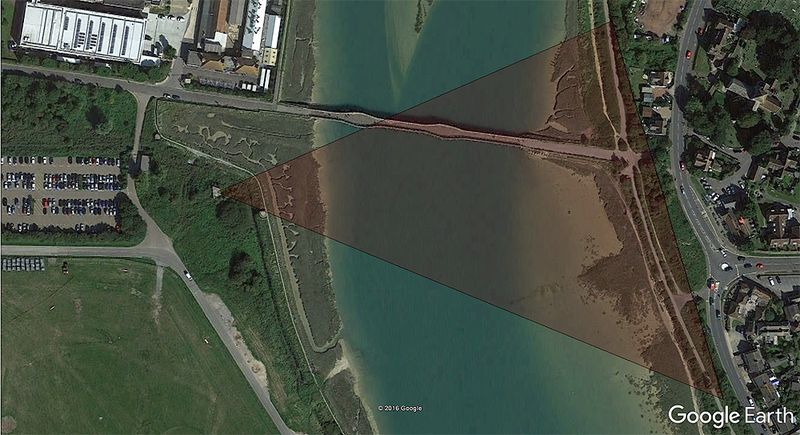 The emplacement covers the old Toll Bridge over the River Adur; the east bank is about 300m away. This proves that the gun was not intended to simply be emplaced with a single line of fire at the bridge; it can actually cover the river and the opposing bank as well as three quarters of the bridge itself. But what about the defence of the area immediately around the emplacement? The photo below shows the garage with a brick-shuttered pillbox to the left. 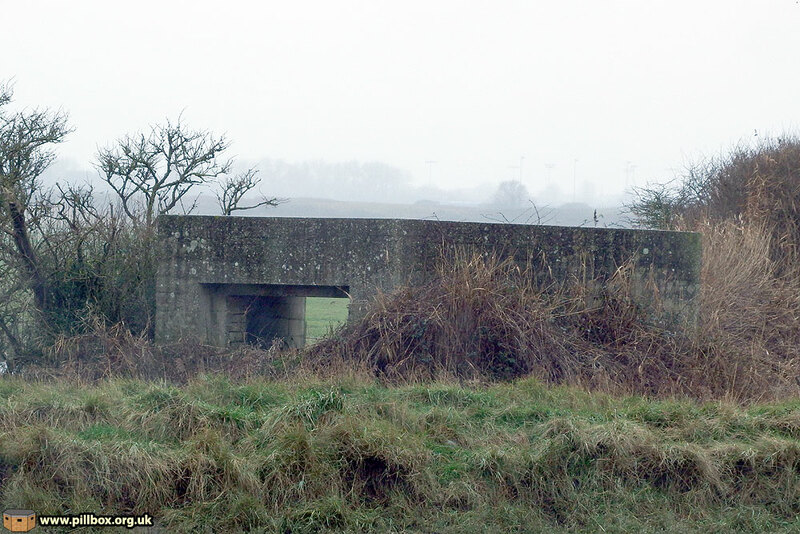 Another pillbox is out of shot to the right. The graphic below is a close-up of the immediate area around the gun garage. 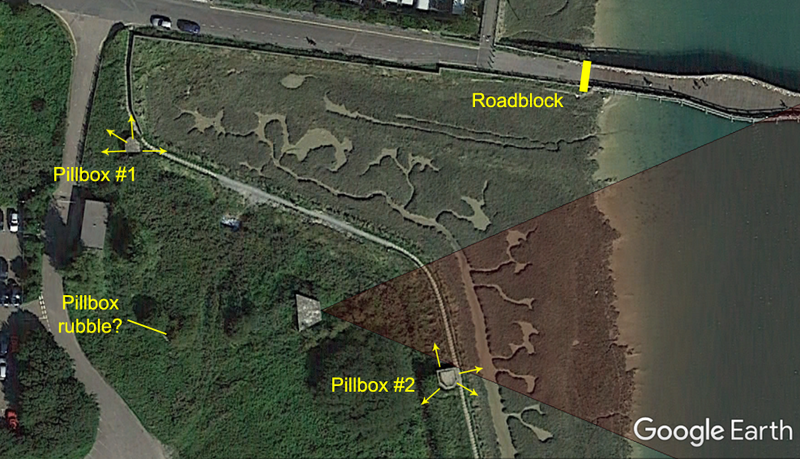 The other defence works, i.e., the two pillboxes, rubble and roadblock are plotted from extant landscape evidence only; there will undoubtedly have been a lot more but this is the sort of evidence that somebody else (I do East Sussex - remember?) needs to get from documentary research. The yellow arrows on the pillboxes indicate the location of embrasures and direction of fire. 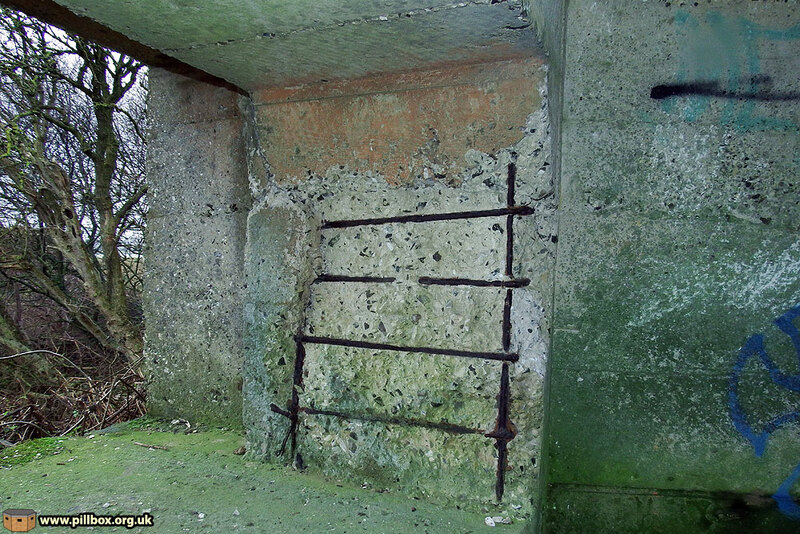 the two standing structures can protect the gun emplacement on three sides. 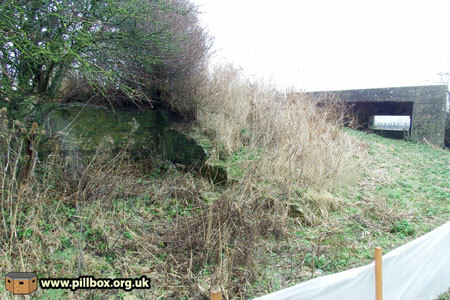 The rubble I have questioned may (or may not) have been another pillbox to cover the rear and to the south. Note how pillbox #2 has been sited just outside of the 45 degree arc of fire from the emplacement; this confirms the arc and also that the defences were laid out with quite some consideration. 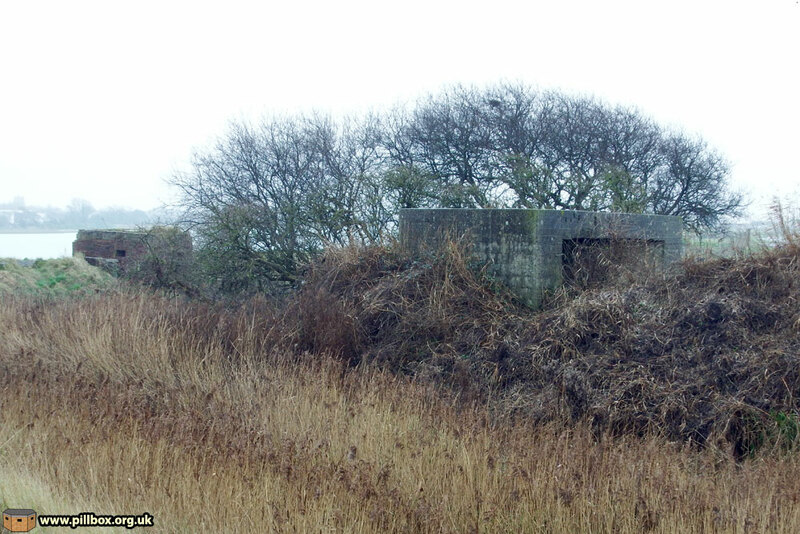 The HER record also states that "Concrete ammunition storage 'bins' are alongside" the emplacement. I found no trace of them, but would query them as ammunition bins, as we have established that a field gun was the intended occupant - and its ammunition (such as was available) would have been stored in the caisson or limber. There are remains of a three-sided brick structure between the rubble and the emplacement (photo at right) but I'm not sure if this is a wartime structure, although other nearby period structures are also of brick. The HER (online version) does not provide any further clues. The gun garage is about 10m away. I've hopefully convinced you that these gun emplacements were not for 25-pounder guns, but how did we get to assume that they were? Well, the HER data comes from the Defence of Britain Project data and the DoB methodology was mostly based around fieldwork and published secondary sources. It seems that the vast amount of files in the National Archives at Kew was not realised until near the end of the project, but the Defence Areas Project (DAP) was an extension of the DoB and made great use of them. The result of the Defence Areas Project was William Foot's excellent book Beaches, Fields, Streets and Hills. The quandary is this; we have the above two project methodologies, the latter being the one that will produce far and away the best results. However, most people are still firmly in the land of fieldwork and secondary sources - they refuse to make the jump to archive documents and this is where I see the fundamental problem lurking. A lot of inaccurate data is thus in the official record; the HERs are used by archaeologists as part of their Desk-based Assessment (DBA) which helps inform fieldwork where appropriate. The problem is that archive research is a slow and often painful process. The files are not helpfully indexed and so the only way is to work through each one in turn. The reason I've managed to write this piece is because I've gathered enough material over 11 years. If you asked me to go to the archives tomorrow and get detailed information on a gun emplacement in an area completely unknown to me, I wouldn't have a hope - and archaeologists simply do not have the time and resources to conduct this sort of research. 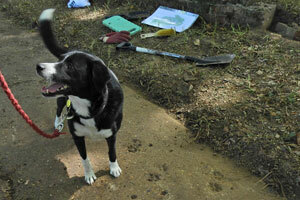 Any available information is gratefully hoovered up and is replicated in archaeological reports. The reports become the record and the record becomes fixed in many peoples' minds. This is not surprising, though, as the HER represents the best data that is available and the accuracy of it is not being verified because the raw data is still sitting untouched in the archives. The HER data is not permanent however, and the teams responsible for compiling and maintaining the data are always grateful for additional information and/or corrections. I shall be informing the West Sussex team of my findings presented here. So... what should we call this structure? I have used the term gun garage throughout this piece as I felt it is a valid colloquial descriptor from primary sources. However, if I were adding this site to my database (I can only cover East Sussex with my work) it would be entered more formally as a "Gun Emplacement (Field Artillery)." Note the use of the class of weapon, as opposed to the role of the weapon. In other words, although we have a field gun theoretically deployed as an anti-tank weapon, the emplacement was built to house a field artillery piece. 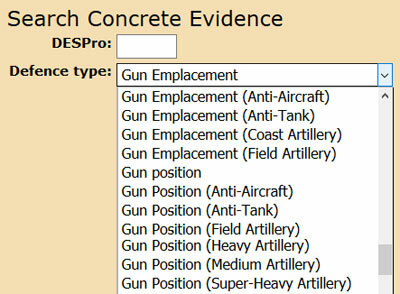 The graphic at right shows part of the search screen for my Concrete Evidence database. I use a controlled vocabulary to describe features and here you can see the terms pertaining to artillery. 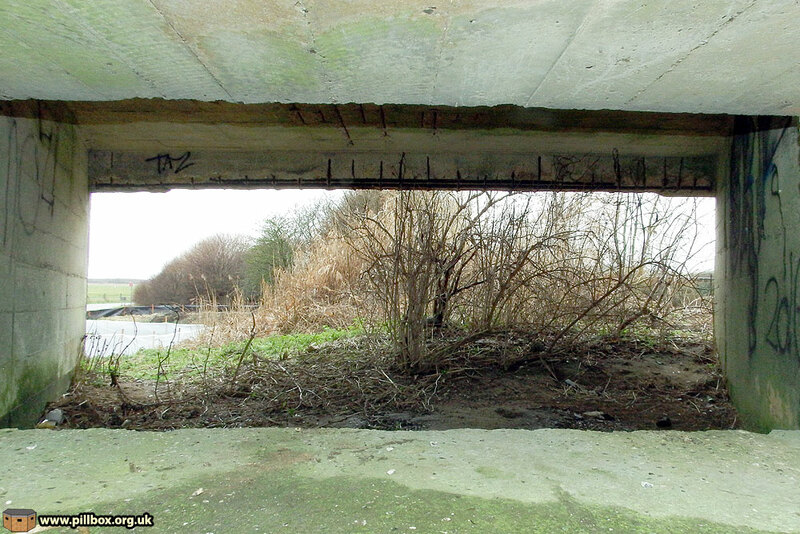 The term 'emplacement' is used to denote a hardened structure, while 'gun position' is used when there is no evidence of a concrete structure. In the event that I cannot identify the weapon concerned, then I simply use "Gun Position" or "Gun Emplacement". While this may be an insignificant issue to many reading this, there is a point to this pedantic level of detail and precision. My point is this; a feature can just be a 'gun emplacement'. Nothing more, nothing less; it doesn't need to have a specific weapon identified with it. It's perfectly acceptable to say that "we don't know", in the same way I have told you of gaps in the research I've done in this case. Indeed, the known documents do not prove that any gun was ever emplaced here. 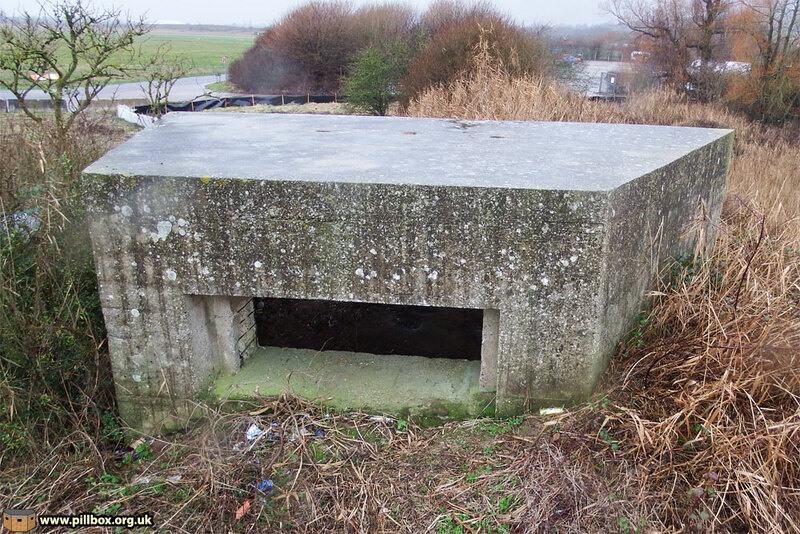 I think the urge to try to identify a weapon arises from the Type 28 pillboxes; the 'expert' can identify the gun from key features in the structure. However, faced with something ambiguous like the gun garage, there is seemingly an anxiety of not being an 'expert' if the weapon cannot be identified. Don't get me wrong; I use guesswork all the time, but in conjunction with as many available sources as possible. (No, I have not exhausted the potential paper trail for this piece, but my knowledge and experience of East Sussex combined with the West Sussex files allows me to have a certain confidence in my argument. You are, of course, welcome to challenge my conclusions!) This brings us back to the 'fieldwork' vs 'fieldwork with archive research' argument. It was the latter methodology that led me to my conclusions about the gun garage design. Fieldwork alone cannot give you data such as how many guns were available in 1940-41. It cannot tell you where those guns were deployed or their fire tasks. My fieldwork did, however, reveal the arc of fire, hidden in plain sight in the design of the structure. It also demonstrated the intricacy with which surrounding defence works at Shoreham were placed; these facts had not been previously been recognised. Combined with archive research and digital reconstruction the fieldwork was critical in arriving at my conclusions. Given that I don't actually study West Sussex or have any particular knowledge of it, it demonstrates that my methodology works beyond East Sussex! If you've made it this far in what has proved to be a long post, then it perhaps indicates that what I'm saying makes some sort of sense! 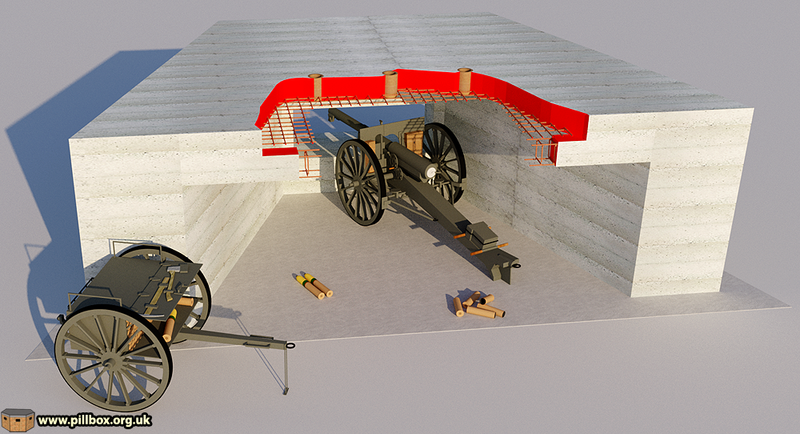 I've made the case for the 'gun garage' having been designed for light field artillery, examples of which that were on issue in 1940 include the 18-pounder/US 75mm and French 75mm guns. I have eliminated the prospect of the 4.5-inch howitzer, 18/25 and 25-pounder guns being eligible on account of them being howitzer weapons, and the lack of the latter two weapons in 1940. The nature of a howitzer makes it unsuitable for this type of emplacement and the known primary sources do not prove that such structures were ever used with them. Was all this research worth the effort? Yes - because I learned a lot from it! I now need to review my interpretation of the complete artillery fire plan for East Sussex and see how the different types of gun determined their role and placement in the landscape. I shall also be comparing the gun garage at Shoreham with a similar structure at Newhaven and this exercise has opened my eyes to fresh approaches in how I go about this. And so the methodology evolves! 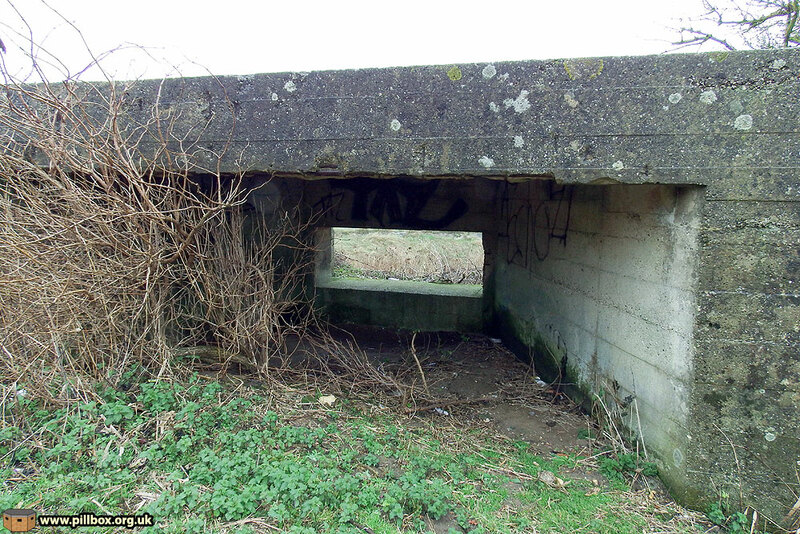 A physical continuous anti-tank barrier, normally a river and/or railway line, often defended by pillboxes. Stop line crossings (roads, railways and bridges) were to be made impassable. 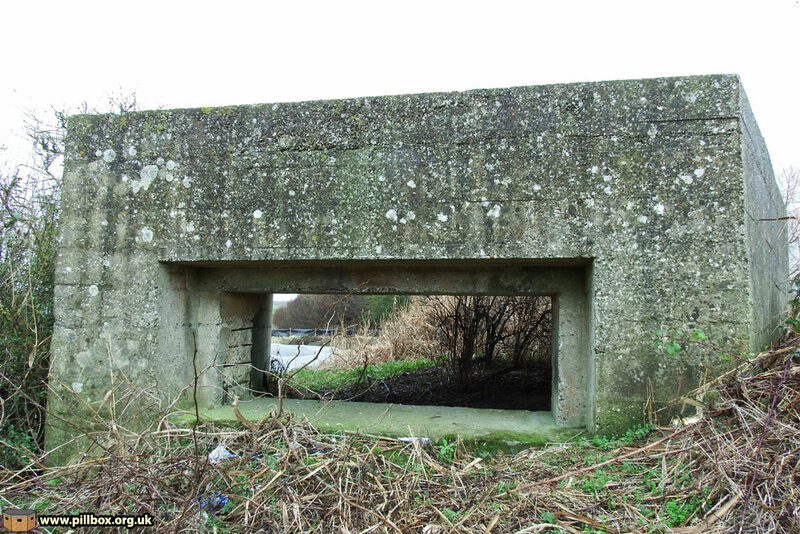 A pillbox designed to house a small artillery piece (typically a WW1 6-pounder gun), usually sited to cover a bridge or other defile. Type 28a variant had an additional compartment for infantry defence.